How to Easily Master Format XIAOMI REDMI 2 PRIME with Safety Hard Reset? Tips and solutions for fix XIAOMI REDMI 2 PRIME problems with simple tricks. This phone have 4.7 inches LCD screen with dual simcard GSM-GSM standby together. This phone is less expensive for better specifications, using Quad Core 64 bit processor with 2 GB RAM and 16 GB internal memory. Main camera of XIAOMI REDMI 2 PRIME is 8 megapixel at back body and front camera 2 megapixel for selfie photography. How to Fix or Problem Solving for Recovery XIAOMI REDMI 2 PRIME hang or not responding or malfunctions or stuck or freezing or bricked ? The XIAOMI REDMI 2 PRIME use MIUI for user interface, this phone already have several factory default applications. With 16 GB internal memory, we can install many free interesting applications from Google Play Store like Facebook, Instagram, Whatsapp, WeChat, Line Messenger, Blackberry Messenger (BBM), Skype, Viber and many more. But for not famous applications, we have to read all user review carefully because some apps may contain viruses or malware. Some applications also may not compatible with our XIAOMI REDMI 2 PRIME. If we install that kind of applications, our XIAOMI REDMI 2 PRIME can become hang or stuck or bricks or frozen or boot logo loop or LCD touch screen not responding. We have to force shutdown or force soft reset or force reboot to clean temporary files and caches. After our phone already finish soft reset, we can try to install one high rating antivirus applications from Google Play Store then scan all and fix bad apps from our phone. If our phone still have problems, then we have to do hard reset or master format. Please note, doing hard reset will wipe or erase all important data from our phone, therefore we have to backup all important data before doing hard reset or master format XIAOMI REDMI 2 PRIME. How to Force Shutdown or Force Soft Reset or Reboot or Restart XIAOMI REDMI 2 PRIME ? The best steps to force shutdown or force soft reset or force reboot our XIAOMI REDMI 2 PRIME when this phone get hang or stuck or LCD touch screen not responsive with our finger touch then please remove back cover case and unplug or remove the battery. Wait about 5 seconds and put again XIAOMI REDMI 2 PRIME battery at right position, continue press POWER button to turn on this phone. If we want to restart all running applications and remove temporary files also caches when our phone still work normally, then please do this steps: While this phone ON, press and hold POWER button until pop-up menu appear, then choose Shutdown / Reboot / Power off menu. The soft reset or reboot process will not remove any important data and will not uninstall anything at our XIAOMI REDMI 2 PRIME, so we can do this process anytime we want. The XIAOMI REDMI 2 PRIME will do the hard reset or master format to factory default process. How to Boot Recovery Mode at XIAOMI REDMI 2 PRIME ? If we need to boot our XIAOMI REDMI 2 PRIME go to recovery mode. We can follow the steps at #Option 2 above from steps no.1 until no.4. After that we will find the menu and choose the menu as what we need to do. How to Restore and Reinstall Clean Android Operating system / firmware at XIAOMI REDMI 2 PRIME (Reformat) ? We already get Android Kitkat operating system when the first time we buy XIAOMI REDMI 2 PRIME, there are also some interesting applications which ready to use with MIUI user interface and also can added more from Google Play Store or APK offline files. But sometime applications can become crash with operating system that can make the OS corrupted or damaged. At this conditions our XIAOMI REDMI 2 PRIME may become strange or not normal. We have to fix this problems by reinstall or reformat factory default operating system at our XIAOMI REDMI 2 PRIME. We have to know that clean factory default Android operating system file source already saved safely inside XIAOMI REDMI 2 PRIME ROM or internal memory, therefore if our phone installed os has already damaged, then we can reinstall or reformat without need to connect with other device. Just follow simple steps to hard reset above, then clean factory default Android operating system will be reinstall or restore automatically. There are also other alternative to reinstall or restore the XIAOMI REDMI 2 PRIME operating system by download the official MIUI ROM for XIAOMI REDMI 2 PRIME at Xiaomi website, copy the downloaded file to external card SDCard using computer with card reader, or connect directly our XIAOMI REDMI 2 PRIME to computer and it will read as removable drive. Copy the downloaded files at external memory and please continue by using XIAOMI REDMI 2 PRIME applications which have name Updater. Follow the menu to finish the upgrade. How to Unlock or Fix or Bypass or Solutions for XIAOMI REDMI 2 PRIME forgot password code or security lock screen pattern or pin (lost password)? We can install many important applications at our XIAOMI REDMI 2 PRIME. Sometime that applications is confidential for other people, this is also include for our important files or photos. Therefore we have to give security protections to secure our XIAOMI REDMI 2 PRIME data while this phone away from us or stolen or lost. There are several factory default options which can we choose to protect, but we usually use screen lock patter, however some users also like to use password pin protections. The problems happen when we forgot screen lock protections answer, what should we do? Do not worry, because we can unlock or bypass forgot security screen lock pattern or password pin protections at XIAOMI REDMI 2 PRIME using Google account. Please turn ON this phone, then give several time wrong answer continuously until XIAOMI REDMI 2 PRIME locked or freezing 30 seconds, at this time we can find Forgot Password / Pattern button, press this button then we can give our Gmail username and password. If we can not access our Google account at this phone, then we have to do hard reset or master format using hardware button combination key. How to Improve Performance XIAOMI REDMI 2 PRIME to make run more faster? XIAOMI REDMI 2 PRIME use Qualcomm 64 bit processor with 1.2 Ghz clock speed. For better multitasking, this phone have 2 GB RAM. But we have to know when we install some applications from Google Play Store, they will keep run in the background to wait data update or wait some command, all running apps whether at background or foreground will consume RAM and processor resources, therefore if many of them work together, then our XIAOMI REDMI 2 PRIME resources will be insufficient and this phone will run more slowly, because some resource will use to try force close not use applications. So please uninstall some not use applications to give more free resources and make this phone faster. If we want to make our XIAOMI REDMI 2 PRIME performance run faster again like new, then please consider to do hard reset or master format. How to Upgrade XIAOMI REDMI 2 PRIME to Android Kitkat or Android Lollipop Official Update? When the first time XIAOMI REDMI 2 PRIME release in the market, this phone use Android Kitkat as factory default operating system. The specifications of XIAOMI REDMI 2 PRIME is already fit to run Android Lollipop without problems. But until we write this information, Xiaomi still not give any confirmation when they will release official Android Lollipop for XIAOMI REDMI 2 PRIME. However, at some other community maybe we can get custom rom Android Lollipop upgrade for XIAOMI REDMI 2 PRIME, but please becareful before doing non standard tweak or root, because some wrong steps can make our phone become stuck and can not use anymore. Is that any other secret code of hard reset XIAOMI REDMI 2 PRIME? At this moment, there is no other secret code or secret key to do the factory reset of XIAOMI REDMI 2 PRIME Just try to do the hard reset above. [A] HI, if you want to master format Xiaomi Redmi 2 Prime, then you have two options. If your phone still can boot normally, then you can follow steps at #Option 1 to reformat/hard reset using menu Setting, this steps is recommended when our phone still can start. If your Xiaomi Redmi 2 Prime conditions is stuck or can not boot or boot loop at logo then you have to do hard reset using hardware button combination key like steps at #Option 2 above. All process will reformat and wipe all account including Google account and all important data. [Q] My phone (redmi 2 prime) didn't have charge and it was off. Then i put for charging, it was being charged but when i switched on the phone the mi logo was shown and then it showed a blue screen. In the mi care, they said its a motherboard problem. Can you just tell me whether its a motherboard problem or some other problem? How can solve this problem? Please, let me know. Thank you ! [A] Hi, usually authorized service center will give better answer because they have seen and checked your Xiaomi Redmi 2 Prime. If the problems have already founded then you have to replace the motherboard as service center guy told you. The information from this page describe about cara reset redmi 2,hard reset redmi prime,redmi 2 prime phone not starting due to memory issue,what to do if wipe data fail during recovery mode in redmi 2. If you need another resource for hard reset, use search function at this homepage or find from our related posts. How to Easily Master Format IPHONE 5s and IPHONE 5c with Safety Hard Reset? How to Easily Master Format SONY XPERIA Z3 COMPACT (D5803 / D5833 / M55w) with Safety Hard Reset? 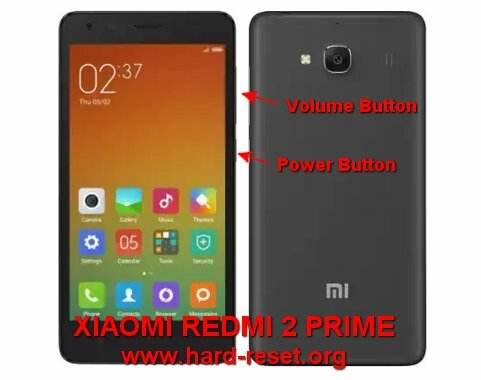 Hi, if you mean you need to install the operating system of your Xiaomi Redmi 2, then please follow steps to hard reset using hardware button combination key like steps at #option 2 above. Or you also can follow reinstall the firmware of Xiaomi Redmi 2 using microSD simcard. Download the official MIUI ROM for XIAOMI REDMI 2 PRIME at Xiaomi website, copy the downloaded file to external card SDCard using computer with card reader, or connect directly our XIAOMI REDMI 2 PRIME to computer and it will read as removable drive. Copy the downloaded files at external memory and please continue by using XIAOMI REDMI 2 PRIME applications which have name Updater. Follow the menu to finish the upgrade. I forgot password after getting my phone in child mode. 1. Go To Airplane Mode, and activate airplane mode. 1. Press call button when screen is locked. 2. Dial 112 or any other number, call > fast, press contact > yellow page. 3. Network setting > turn off child-mode. Hi, you can try to restore forgotten password using Google account. Please try to give several time wrong answer continuously until your phone freezing 30 seconds, at this time press Forgot Password button, and type Gmail account that you have already signed-in before. Please make sure your Xiaomi Redmi 2 Prime still can connect to Internet, because it will ask authentication to Google server. If you can not access your Gmail account at this phone, then the only solution is doing hard reset using hardware button combination key like steps at #option 2 above, but sadly your important data may wipe or remove as well. My phone (redmi 2 prime) didn’t have charge and it was off. Then i put for charging, it was being charged but when i switched on the phone the mi logo was shown and then it showed a blue screen. In the mi care, they said its a motherboard problem. Can you just tell me whether its a motherboard problem or some other problem? How can solve this problem? Hi, usually authorized service center will give better answer because they have seen and checked your Xiaomi Redmi 2 Prime. If the problems have already founded then you have to replace the motherboard as service center guy told you. HI, if you want to master format Xiaomi Redmi 2 Prime, then you have two options. If your phone still can boot normally, then you can follow steps at #Option 1 to reformat/hard reset using menu Setting, this steps is recommended when our phone still can start. If your Xiaomi Redmi 2 Prime conditions is stuck or can not boot or boot loop at logo then you have to do hard reset using hardware button combination key like steps at #Option 2 above. All process will reformat and wipe all account including Google account and all important data.